Kansas State University National Strategic Selling Institute, or NSSI, director Dawn Deeter has been elected to leadership positions in two prestigious sales education organizations. 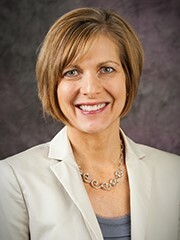 Deeter is the president of the University Sales Center Alliance, a consortium of sales centers established in 2002 that connects university faculty members with many different backgrounds and areas of expertise. Together, these credible and innovative educators advocate for the continuing advancement of the sales profession through teaching, research and outreach. In her role as president, Deeter leads an executive team that is developing and implementing a strategic direction for the organization. She also will provide assistance to universities that are in the preliminary stages of developing a sales program, and promote the benefits of sales education to both employers and non-participating universities. She also was recently elected as the vice chair of communications for the Global Sales Science Institute, an international network formed in 2007 by both academics and practitioners involved in sales and sales management. Its aim is to unite the study and practice of sales and sales management around the globe, by bringing together scholars and practitioners from across the world to further advance global collaboration in sales research, practice and education. Last summer, Deeter served as the co-chair for the group’s annual conference in Hiroshima, Japan. As vice chair of communications, she will create and disseminate a newsletter highlighting Global Sales Science Institute conference activities, disseminate information arising from steering committee meetings, and develop changes in the organization’s by-laws, as appropriate. Under Deeter’s leadership, the National Strategic Selling Institute has been named one of the top sales programs in the country by the Sales Education Foundation for four straight years. The institute’s strategic selling certificate program is open to all majors at the university, and allows students to distinguish themselves by demonstrating professionalism and competency in selling skills.